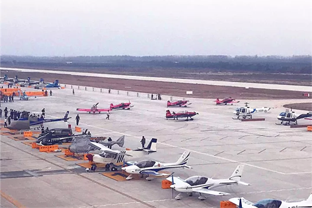 A light aircraft made in Wuhan successfully completed its maiden flight using the 1,600-meter runway of Hannan General Aviation Airport in Wuhan, Hubei province on Nov 7. Vice governor Zhou Xianwang investigated the construction progress of the Hannan General Aviation Airport and the situation of the 2017 World Fly-in Expo on Nov 6, in Wuhan, Hubei province. The 2017 World Fly-in Expo kicked off in Wuhan, central China's Hubei province, on Nov 4, attracting thousands of athletes, pilots and trainers from 37 countries and regions. On the theme of "The vast sky we fly together", the 2017 World Fly-in Expo will take place in Wuhan, Central China's Hubei province Nov 4-7, offering a world-class aviation sports event and gathering global industry participants. 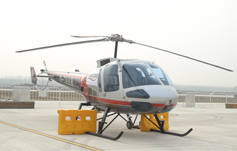 ​Wuhan Economic and Technological Development Zone (Hannan) is focused on industrial innovation and upgrading, particularly in intelligent technology and the general aviation industry, according to a senior official. Aircrafts parked at the Wuhan Hannan General Aviation Airport in anticipation of the upcoming World Fly-in Expo, which will be held from Nov 4 to 7. ​Wuhan Economic and Technological Development Zone (Hannan) made remarkable progress in 2016. A video presentation on the upcoming World Fly-in Expo began showing in New York’s Times Square, dubbed the Crossroads of the World，at 9:00 am on Oct 24 (local time).